It’s easy to know “Who you’re gonna’ call” when the highway becomes an ectoplasm obstacle course! 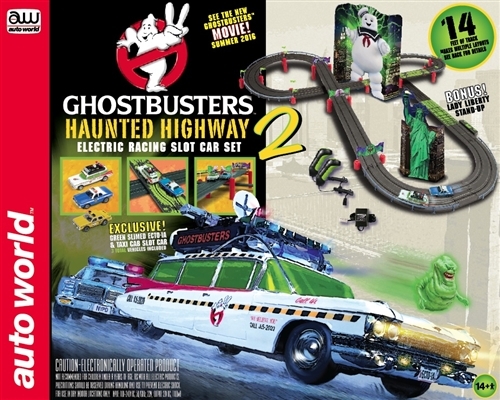 The 14-foot Ghostbusters™ Haunted Highway 2 Slot car set is packed with spirited fun! Race the Ecto-1A around the track against the NYPD police car, or the NYC Taxi cab. You’ll drive through the legs of the Stay Puff Marshmallow man, past the bonus Lady Liberty trying to avoid wrecking on the zigzagging ectoplasm track! It’s high speed paranormal fun!